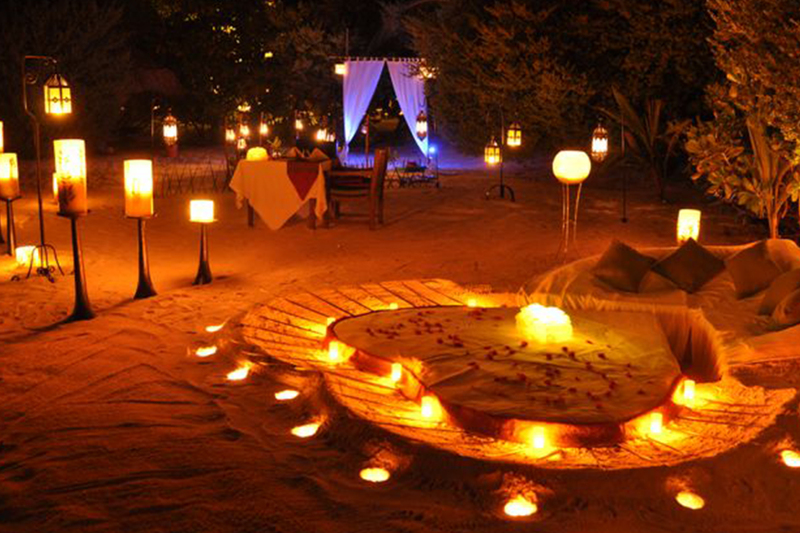 Escape the frenetic pace and chaos of everyday life, in to luxury’s very own lap at Taj Exotica Resort & Spa, Maldives. Away from the sparkling lights of Male, this hotel is spread across the Emboodhu Finolhu island in the middle of one of the largest lagoons in Maldives. Renowned for its rich flora and fauna, this tropical isle, also known as the Three Coconut Isle, is situated amidst the coral reefs. A 15-minute speedboat ride from the airport brings you to the idyllic resort surrounded by the azure waters of the Indian Ocean. Set delicately over the lagoon, this postcard-perfect getaway offers 64 sea-view villas and suites that are luxurious and lavish; yet maintain a fine balance with nature. Our world-famous, award-winning presidential suite is, arguably, the most beautiful place on earth. The adjacent Lagoon Villas are on the island located just a few steps away from the lagoon. These villas feature rainshowers and bathtubs that have sweeping views of the ocean, and are just perfect for your tropical getaway. Built on stilts in the lagoon, these villas provide infinity views of the horizon. Climb down the steps from your private deck into the turquoise waters or choose to watch the vast expanse of the mesmerizing Indian Ocean from your private pool. A slice of heaven. With an exclusive private outdoor area, these 3 newly designed Premium Villas come with a master bed and bath combination, extravagant round bathtub, a manmade private beach area, oversized plunge pool, verandah with sun beds, a tropical outdoor shower in a private walled garden and an infinite view of the lagoon. Set on the fine white beach sand, these magnificent villas are mere steps away from the lagoon. Soak in the pleasures of a tropical outdoor shower experience in your private walled garden to complete the Maldives’ experience. The One-bedroom Ocean Suite is tastefully designed with a bedroom attached to a glass walled bathroom overlooking the lagoon. Relax in your private pool surrounded by a suspended sundeck with powder-soft sand. Just five meters from the lagoon, each villa has a spacious living room, private courtyard, sunset balcony to soak in the views and tropical outdoor showers in a walled garden. Choose between cooling off in the ocean or your private pool. Enjoy the dazzling view from the sunset balcony on the first floor of the Two-bedroom Beach Villa Suite with Spa and Pool. The first floor has a massive bathroom attached to the master bedroom. Get your Jiva treatments in the attached spa room. This award-winning The Rehendi Presidential Overwater Suite with Pool is every bit as luxurious as it is grand. With a titanic freshwater pool and sundeck, two ‘salas’ and the hammock suspended over the turquoise lagoon, this is the best of the Maldives. With endless views of the turquoise lagoon, 24 Degrees offers a culinary journey that traverses the Far East all the way to the Western Front. Enjoy a sumptuous breakfast under the shade of the dhigga trees or even a romantic dinner under the beautiful night sky, or Japanese live kitchen Teppanyaki dinner at this all-day-dining restaurant. Soak in the spellbinding ambiance of our restaurant, Deep End. Perched atop waters with partial al-fresco seating, candlelit tables, sound of the waves and the gentle breeze setting the scene for a perfectly romantic evening accompanied with an unparalleled Mediterranean dining experience. Experience a mélange of enticing flavors from the countries touched by Mediterranean basin with the finest ingredients put together by our culinary experts in Mediterranean grills. The scrumptious menu comprises of traditional vegetarian and non- vegetarian Arabic mezze, Moroccan Tajines and a trail of kebabs. Complete your meal on a sweet note with our signature dessert, Opera that will transcend your dining experience. The poolside makes for a beautiful, romantic and lazy lounge area on warm days and nights. The Poolside Bar and Grill gives you the luxury of sipping on a refreshing frozen cocktail and nibbling on some light snacks while you cool off with a dip in the infinity pool.Drink in the romance and delicious cocktails and brews at this bar adjacent to the resort’s infinity pool. At the Equator Bar, watch the sun go down as you lounge in the sunset patio for an evening soaked in music, merry-making and laughter. Unwind at this stylish contemporary bar and choose from the selection of traditional vintages, new world wines, cocktails, cigars and shishas.Choose from our wines, traditional vintages, cocktails, cigars and shishas, all on the spectacular sunset view patio.